Christmas Wreaths look too festive. My mom would make these during the holidays, and if you have ever made rice Krispie treats, you can make these fun little cookies. These are made with corn flakes, marshmallows, butter, and red hots. Every year during the holidays we feel compelled to make cookies. I have a friend of mine that most years she makes massive amounts of cookies, and I love to go over there, and while I am put to work, I also get in trouble for feeding as many cookies as toddlers like to eat. Toddlers love cookies. For me it isn’t the holidays unless you have some 7 layer cookies, in my house we always called them Hello Dolly cookies, why? I don’t know. Pecan Sandies are my next runner up when it comes to holiday cookies. Cornflakes can be made to look like festive Christmas wreaths. In a medium-sized saucepan. Melt 1/3 cup of butter with 10 ounces of marshmallows. While the butter and marshmallows are melting together add in 6 to 8 drops of green food coloring. Once the butter and marshmallows have melted together gently stir in 6 cups of corn flakes coating the corn flakes with the marshmallow mixture. Take a 1/4 cup measuring cup and spray with a non-stick spray. Scoop corn flake mixture out onto waxed paper. Spray fingers with non-stick spray and quickly shape the corn flakes into a holiday wreath. Immediately add 3 or 4 "Red Hots" over the wreath. 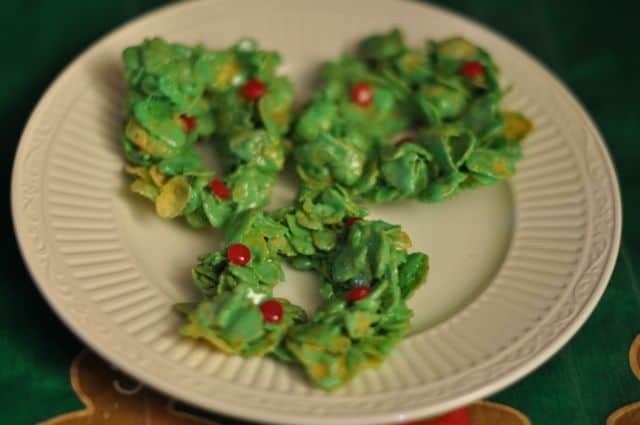 Quickly work with the remaining corn flake mixture making wreaths as quickly as possible. I add a teaspoon of almond extract, eveyone love them. I bet they are great with some almond extract. Yes…always add the almond extract for the Christmas wreaths!